Carol Exline of Ribbons and Retro and Rags and Rhinestones has loved vintage pieces since she was a child – she started selling handmade items on Etsy before returning to the allure of vintage. She’s now a full-time treasure hunter that passes along her fantastic finds. Carol agreed to share some tips and tell us about some of her best buys. 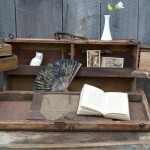 It is clear that you love vintage items. When were you introduced to vintage finds? It started when I was a child. I remember digging in the dirt at my grandparent’s farm in Colorado and finding pieces of old, broken china and glass. My sister and I would try to piece them back together. I also inherited some hand-painted glass heirlooms from my grandmother. She worked in glass factories in West Virginia and Tennessee, so I loved learning the history behind the pieces. I started my Etsy shop to sell handmade items, but I had some vintage jewelry from a family member and decided to sell it. It sold fast, so I started looking for other items. Eventually, selling vintage left no time for handmade items. Tell us about finding items for your shop. 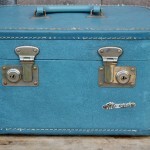 The treasure hunt is what makes selling vintage items so much fun, but it’s still hard work! As with any business, it’s important to remember that time is money; you need to plan well. If you drive a few hours for a sale, you don’t want to come home empty handed. Do your homework to know if they’ll have the right types of items before you go. Auctions and flea markets are great sources; I also visit estate sales and yard sales if the items are appealing. I frequent thrift stores in the winter, since auctions are pretty scarce. No matter where you’re picking, you have to be ready to dig and get dirty. I’ve had to overcome my fear of spiders – a lot of stuff comes complete with cobwebs and creepy crawlies! What’s been your most excellent and memorable find? There are actually a couple! 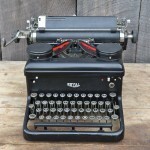 The first is a vintage typewriter (recently sold) and other items found in an old hotel in Fredricksburg, VA. The estate belonged to an actress from the 1950’s – she lived in the hotel up until her death. It was like walking into a time warp! She had changed very little in 50 years. The furnishings and parts of the building were amazing, but other sections of the building were in such disrepair that had to be blocked off to keep people from falling through the floor. We drove over 3 hours in pouring rain to that sale, but it was so worth it! 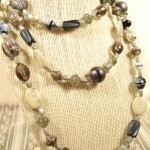 The other item is listed in Rags and Rhinestones – a Hattie Carnegie art glass necklace, still new with the tags on it! I discovered it in a box lot of jewelry at an auction and was determined not to leave without it. We waited and waited in 40 degree weather and it was almost the last thing they sold. We were so cold we couldn’t feel our feet – I had to buy a blanket during the auction to stay warm! I got the necklace and several other great finds that night, and only a little bit of frostbite. What is the biggest challenge as a vintage seller on Etsy? Shipping! I rarely list more than one of any item, so creating shipping profiles is almost impossible. Everything is a different weight and size. When you add in international shipping, you have to be aware of customs regulations to make sure the item is allowed. I love the weathered wood that you use for a background in some of your photos. Did you experiment with other backgrounds? Photography and backgrounds have been the hardest thing to get right. The weathered wood is our temporary garage door, where I shoot when I can take pictures outside. 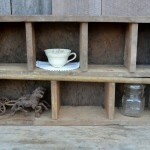 It works really well for the rustic items in my shop, but not for everything. I’ve never really liked an all white background, but I’ll use it for items like toys and books. I’m still experimenting to find the perfect indoor backgrounds. Your husband is a collector of vintage things as well. What role does your family play in your business? My husband has his own business – building and restoring muscle cars, street rods, classic cars and customs. If it’s old school, he loves it – especially the 1950’s style hot rods! He shops flea markets and auctions with me and is good at noticing smaller things I might overlook. He’s especially fond of old books, magazines and newspapers. My kids try to stay as far away from my Etsy stuff as possible! My oldest daughter has already moved out, but sometimes accompanies me to big, neighborhood yard sales. My middle daughter just tries to ignore the whole thing, although she does sometimes want a treasure that catches her eye. And last is my son, who is 17 and still sometimes forced to run errands with his mom. He has endured a few flea markets and thrift shops and has found a couple things for me. He also helps move larger items and is an extra hand during photography sessions. For the most part, they just don’t understand my fascination with “old stuff”. Is there an item in your shop that you want to keep for yourself? I’m not a collector, so I’m hardly ever tempted to keep anything. My husband is another story! 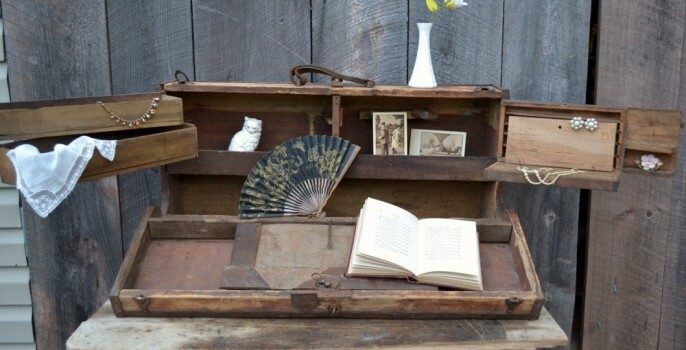 There have been several items he got attached to and wanted to keep, such as the typewriter and an awesome carpenter’s tool box I sold last year. He’s been known to pull things from the trash that I thought weren’t worth keeping! Thanks Carol for sharing the great stories! 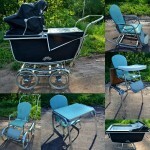 Vintage hunting sounds like quite a rollercoaster – hard work punctuated by the excitement of a great find. Carol can be found on her Etsy shops, Ribbons and Retro and Rags and Rhinestones, as well as on Twitter.